According to a 2017 study, Florida ranks 49th among the 50 states in terms of distracted driving. Only Louisiana drivers pay less attention to the road than motorists in the Sunshine State. 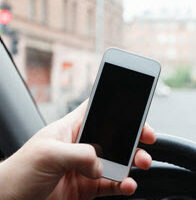 Orange County is ground zero in terms of distracted driving crashes. It has almost twice as many such incidents as any other Florida county with over one million people. There is some support for toughening Florida’s distracted driving laws, which are currently among the weakest in the country. That weakness makes it more difficult, but certainly not impossible, for personal injury attorneys to win these cases in court. That violation substantially caused the crash. If the law in question was not a penal law (i.e. carried no possible jail time), negligence per se may only be a presumption of liability. The jury determines all facts in the case presented during a trial. So, even if the tortfeasor was not convicted of a distracted driving violation, the negligence per se shortcut may still apply. That’s especially important in Florida, because in the Sunshine State, using a cell phone is not a primary offense. Visual distraction (taking one’s eyes off the road). Hands-free devices are a good example. Many people believe these gadgets are safe alternatives to cell phones. But that’s not true. Hands-free devices are still visually and cognitively distracting. Moreover, these gadgets lead to distraction latency. According to the AAA, it takes drivers almost thirty seconds to shift focus away from the hands-free device and onto driving. A lot can happen in thirty seconds. Furthermore, some distracted driving claims have nothing to do with devices. Eating while driving, talking to passengers, and using a GPS navigator all technically constitute distracted driving. Sometimes, Hillsborough County jurors consider these behaviors to be a lack of care. If that’s the case, liability for damages may attach. These damages usually include money for economic losses, such as medical bills, and noneconomic losses, such as pain and suffering. Distracted driving crash victims have multiple legal options. For a free consultation with an experienced car accident lawyer, contact The Matassini Law Firm, P.A. We do not charge upfront legal fees in auto accident cases.